Do you remember these light and fluffy dinner rolls I made way back when? They were one of my first experiments with einkorn and they are MIND-BLOWING delicious and they are worth every single one of the many ingredients and steps. But sometimes you still with a light and fluffy dinner roll without all the hoopla, right? That’s where this cloud dinner roll recipe comes into play. 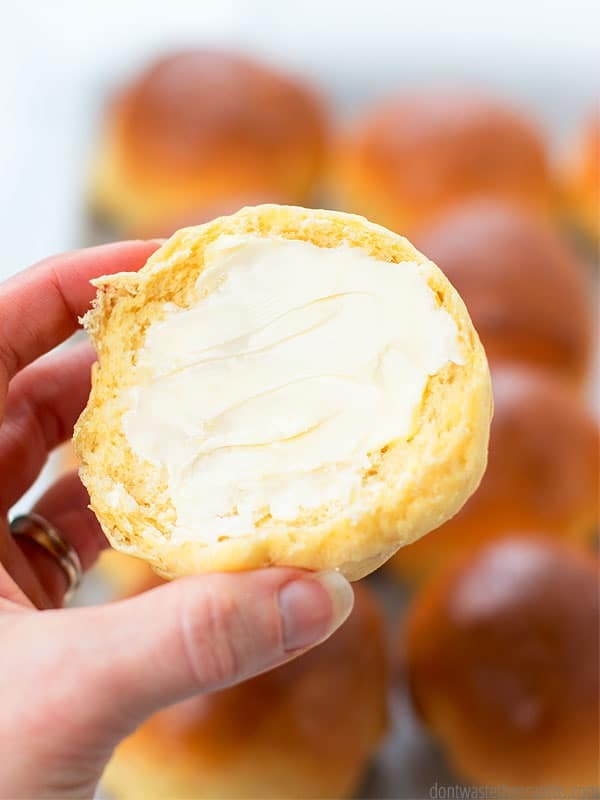 These are NOT a version of cloud bread or oopsie bread or any other non-bread Keto-bread that could be out there. 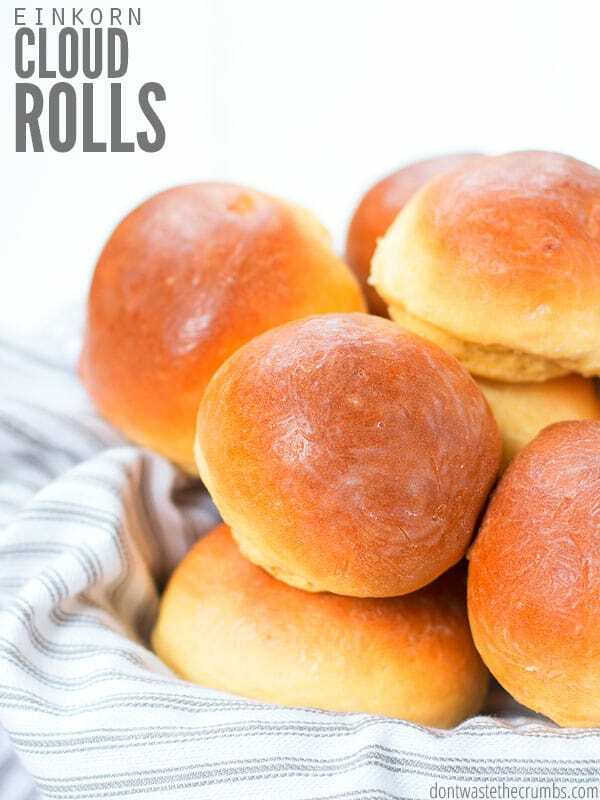 This dinner roll recipe makes some of the lightest, fluffiest rolls you’ll ever eat in your life, ever. And they’re made with just a few basic essential ingredients that you’d use in any other easy bread recipe like 90 minute man bread or no-knead overnight artisan bread or even easy white sandwich bread. If I remember correctly, she graciously stepped away, said her goodbyes and left. If I remember wrong, it doesn’t matter because SHE DIDN’T GIVE ME THE RECIPE! It wasn’t until two years later when I told her we were moving across the country (literally) and asked her again for her cloud dinner roll recipe that she FINALLY gave it to me. It was written for a bread machine. Which I don’t own and don’t plan to buy. Ever. Have you ever watched “The Great British Baking Show” on Netflix? You know how they have a technical challenge that is missing crucial steps, like amounts of ingredients, which ingredients go with which steps and times on rises? Yeah, the recipe he sent over was kind of like that. It took some deciphering and my own conversion for making bread machine recipes by hand – along with several trials and errors and LOTS of butter – in order to get the recipe worthy enough to share with you guys, but ALAS, we made it through and now we have another AMAZING dinner roll recipe to share with you! Can we revisit einkorn flour for a moment? Not too long ago we thought my husband had some food sensitivity issues so we embarked on the Whole30. Then I remembered about einkorn… Einkorn is an ancient grain, not hybridized like modern wheat is, and many people who are sensitive to gluten (not allergic or Celiac) can tolerate it well. We gave it a shot and HOORAY!!! They tolerate einkorn just fine. BRING ON THE BREAD! One of my 2019 goals is to bake exclusively with einkorn – not just because of my husband and daughter, but also because overall it’s a healthier grain than modern wheat. Baking with einkorn is a bit of a challenge though. I need light and fluffy dinner rolls TONIGHT. At the same time, many real foodies (including you?) may not have switched over to einkorn yet. It’s not a baby step at all, like keeping your grocery receipts or eating seasonally or even making your own homemade spices. Switching to einkorn is definitely an advanced step and it’s one you may not ever make. And that’s ok! That’s why I wrote this recipe to include both einkorn OR all-purpose flour – that way regardless of where you are in your real food journey, you can have an amazing dinner roll recipe in your arsenal! If you don’t have active dry yeast but instead have quick rise yeast, use twice as much. Use any type of granulated sugar you have. I used Turbinado. You want warm water, not hot. Warm water is between 105 F and 110 F. For reference, boiling water is 212 F. I like to run my tap water until it’s as hot as it will go, and that usually puts me right around 110 F. If you warm your water any other method, use a thermometer. I have not tested any other fat in this recipe besides butter, but I think ghee would work without any issues. 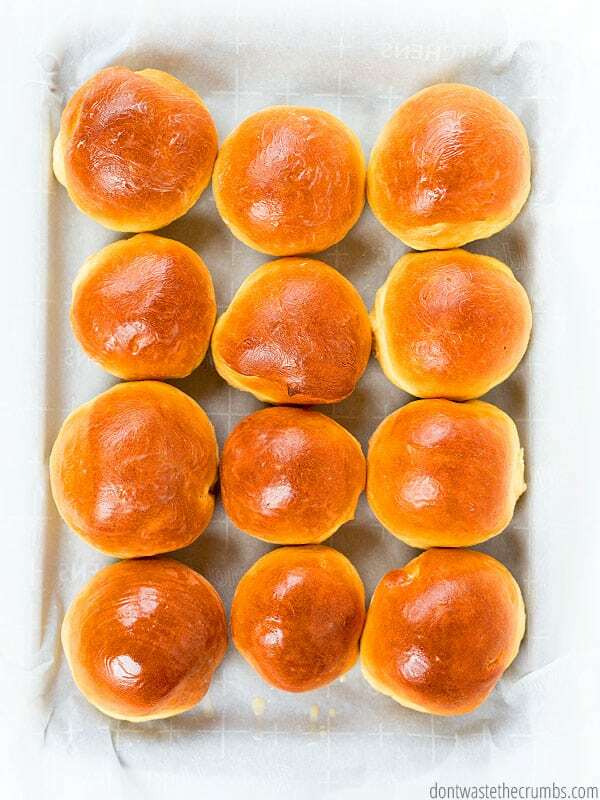 You can likely use coconut oil, but the dinner rolls may not rise as nicely OR they may be denser in the end. Psst! 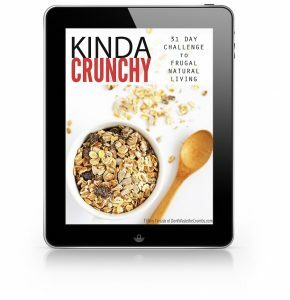 If you want to learn more about how to start eating healthy in your home, or if you’ve tried making changes in the past but they haven’t stuck, then you will definitely want to check out my eBook Kinda Crunchy: a 31-Day Challenge to Frugal Natural Living. Combine yeast, sugar and water in the bowl of a stand mixer (or a large mixing bowl) and whisk together. Let it sit until the liquid is foamy. Add 3 cups of flour and mix on low (or by hand) for about one minute. Add 2 Tbsp of soft butter, egg and salt and continue to mix on low speed until the ingredients are well combined. Turn the mixer up to medium speed and add flour 2 Tbsp at a time, waiting 60 seconds before adding more, until the dough is smooth and elastic and pulls easily away from the sides of the bowl. (I used 3 ½ cups + 2 Tbsp of flour.) The dough is ready when you push your finger into it, it leaves a mark, and you can pull your finger out without dough sticking to you. Cover the dough with a kitchen towel and place in a warm spot to rise until double in size, 1-2 hours. Punch the dough down and turn it out onto a floured surface. Divide the dough into 16 equal pieces and place them 2 inches apart on a cookie sheet lined with a silpat mat. Melt the remaining 1 Tbsp of butter and lightly brush the tops of the rolls. Cover gently with a towel and let it rise until doubled in size, 30 to 40 minutes. When the rolls have finished rising, bake for 12-15 minutes until golden brown on the outside (note that einkorn flour will darken more quickly than conventional all-purpose flour). Best served immediately when warm. 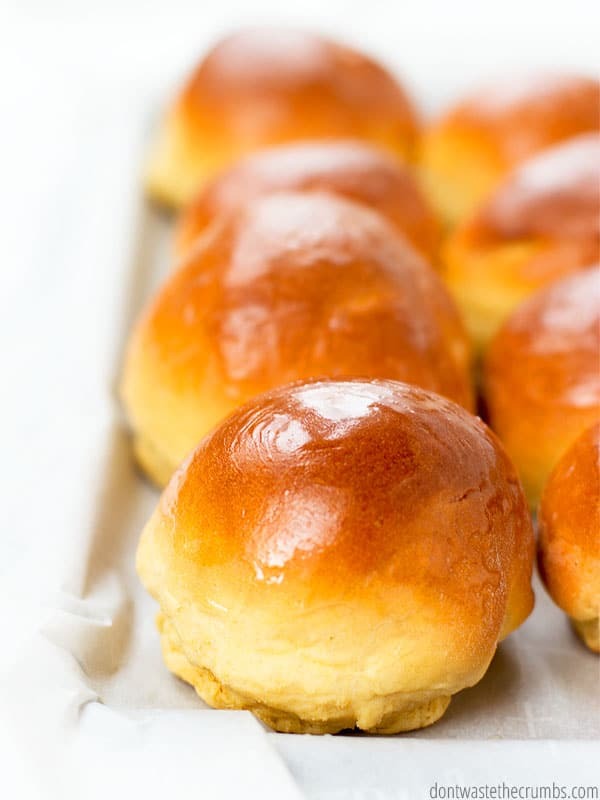 Keep leftover rolls in a container with a lid at room temperature for 3 days, or in the refrigerator for u to 5-7 days. Let me know how delicious and fluffy you think these are after you try them! 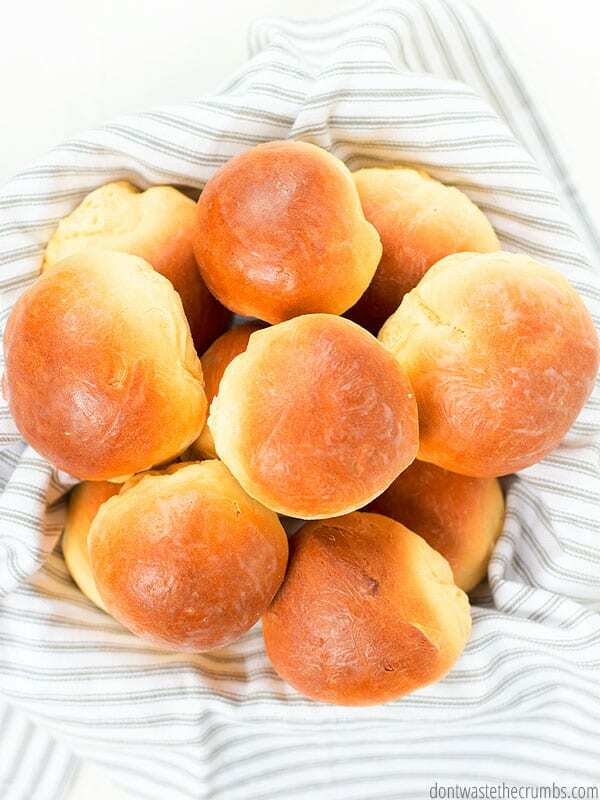 What’s your favorite dinner rolls recipe?